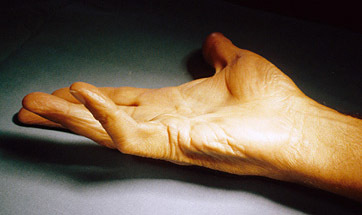 Dupuytren’s Disease is a benign, but troublesome, condition in which the normal tissue – or fascia – beneath the skin of the palm starts to become abnormally think and forms lumps and cords. As the disease progresses, these firm cords can lengthen and extend into the finger. When the finger becomes involved the motion of the finger, especially straightening it, can become limited. Noticing firm lumps or cords in the palm of your hand, which may extend into your finger, is the classic finding of Dupuytren’s Disease. If the diseased tissue is just in your palm you may not have any difficulty using your hand. If the finger is involved there is usually difficulty trying to straighten it because the cord is tethering the joint, leading to a contracture. The closest and middle knuckles may each or both be involved. The little finger is the most common finger to be involved. Pain is not typically associated with Dupuytren’s Disease. However, pressure on palmar nodules may cause callus and pain. Dupuytren’s Disease is a benign genetic disorder. The disease is most commonly found in people with family heritage from northern Europe and Scandinavia, hence the nickname “Viking Disease.” Men seem to inherit the diseases more often, though women can have it too. Speaking with you and examining your hand will provide the correct diagnosis. X-rays may help to rule out other conditions as well. For cases that just involve lumps or a cord in the palm and without pain or stiffness of the hand, no treatment may be necessary besides observation. When a finger is involved with a cord and becomes stiff, treatment to straighten the finger may be indicated to improve motion and reduce the risk of further contracture. There are several ways to straighten the finger. Outpatient surgery can be performed to remove the cord causing the finger contracture, along with other abnormal tissue causing lumps and cords in the palm. Another technique is called percutaneous needle fasciotomy, which involves using a needle to disrupt the cord causing the finger contracture, thereby allowing the finger to be straightened. The abnormal tissue, though, is not removed from the hand. This type of procedure cab be performed in the office with local anesthetic. The newest technique involves injecting a medicine called Collagenase into the cord. This medicine works at a molecular level to disrupt the cord. A day or two after the injection the patient returns and the finger is numbed and then manipulated to break the now weakened cord and eliminate the contracture. This type of procedure is also done in the office, and like percutaneous needle fasciotomy, the abnormal tissue is not removed from the hand. Dupuytren’s Disease benefits from prompt diagnosis, especially when a finger contracture develops. Call Dr. Pruzansky at 212-249-8700 to schedule an appointment and take control of your hand.